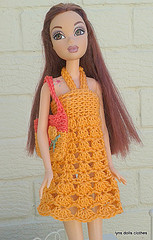 This is a very easy and quick sundress and bag for Barbie. The dress is made from the top down in rounds for the bodice and rows for the skirt. You could made a matching hat - see the Easter bonnet post. you will need about 30g of cotton 4ply in main colour and a small amount of contrast. I used Patons. Note: cotton thread is not suitable for this pattern as its too thin. Abbreviations: Dc: double crochet (US single crochet), tr: treble crochet, (US double crochet), htr: half treble, ch: chain, slst: slip stitch. Repeat last round 4 times. Using no 3mm hook and main colour, make 26 ch. 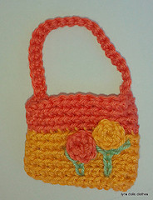 I am trying out a new way to allow downloads for my patterns. Follow the link below then click on the download button (small downward arrow on top right).